The Drop Cap Pendant Set is a tailor-made accessory for Plumen bulbs—perfectly covering the lamp holder, it frames Plumen bulbs to give them a polished, finished look. 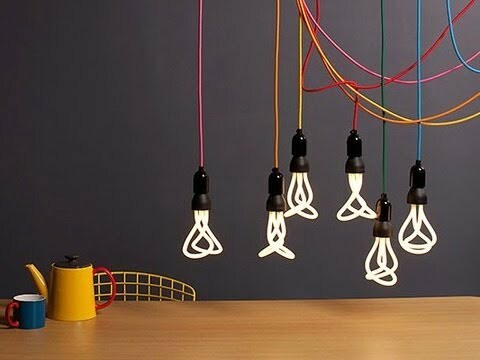 Dimensions: 7" x 4.5" x 3.5"
The Plumen 001 energy-saving light bulb takes its form as seriously as its function. The lighting tubes have an organic, sculptural quality. 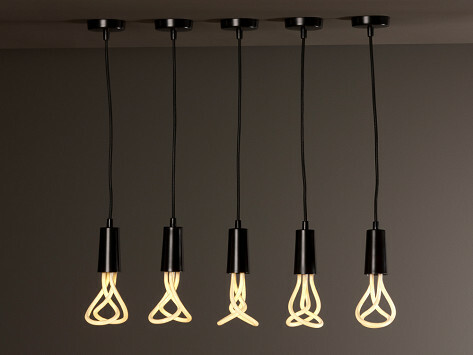 They give the bulb a distinctive silhouette that changes as you view it from different angles. Conceived by the product design firm Hulger, with an assist from British designer Samuel Wilkinson, the Plumen 001 gets its name from the word “plume", which describes a bird’s show feather. Except for its energy-efficient qualities, it’s nothing like the typical boring compact fluorescent bulb that you want to hide immediately under a lampshade. This bird is show-worthy.